On March 16, 2012, during his fourth deployment, Army Sergeant First Class Christopher Montera was on a dismounted mission in Siah Choy, Afghanistan, with the 5th Battalion, 20th Infantry, 3rd Brigade, 2nd Infantry Division, when an enemy mortar round hit a detonation cord causing a secondary explosion. The blast threw SFC Montera 50 feet, resulting in second and third degree burns on 60 percent of his body, a broken neck, broken legs, orbital fracture, a blast lung and spinal cord injury. Upon his arrival at Brooke Army Medical Center in San Antonio he underwent many surgeries including the amputation of both legs above the knee and extensive skin grafting. In July 2012, he was transferred to the Poly Trauma VA Hospital in Palo Alto and then to Balboa Naval Hospital in San Diego for physical therapy. Christopher hasn’t let his injuries prevent him from having an active lifestyle. 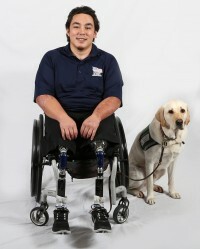 He participates in wheelchair fencing and adaptive Crossfit. He is also an avid duck hunter with his brother and father. Despite his busy schedule, Christopher still faced challenges in his daily routines in his previous home. His specially adapted home from Homes For Our Troops with widened doorways and hallways, hardwood flooring, and a roll-in shower alleviates many of his challenges. The home also allows Christopher to have a fenced in yard or enclosed area for his service dog, Simon. Without the worry about his mobility, Christopher is able to concentrate on school and pursue a career. He is currently pursuing an associate’s degree in history. He and his wife Vi are got married in September 2018.